Ahead of a crucial Politburo meet of the ruling Communist Party, Chinese Premier Li Keqiang has said that China will maintain a sustained growth rate. “The Chinese economy will keep growing in the long term, in a sustained and healthy way,” he said. The premier was addressing a gathering of Chinese and foreign business leaders in Beijing on Friday. 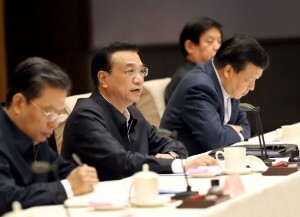 “We will comprehensively deepen reform,” Li said. “For several years in the future, China’s economy shall continue to grow at mid- to high speed,” he added. Li was speaking at the 21st Century Council, a non-governmental forum composed of former heads of state, top global intellectuals and entrepreneurs. The World Bank has said recently that China needs to implement major reforms in order to turn into a high-income nation. In growing signs that expansion might pick up this quarter, China’s manufacturing activity reached a 18-month high in October. China’s purchasing managers’ index (PMI) for the manufacturing sector rose to 51.4 per cent in October, hitting a new high since May 2012, the National Bureau of Statistics (NBS) said Friday. Chinese leaders will hold a four-day meeting of the Politburo, known as the Third Plenum, starting November 9, to lay out a blueprint for China’s social and economic reforms.